-Zero maintenance italian make diaphragm spray pump. *italian make two way nozzles. *long lasting ceramic nozzles tips. *HTP plastic tank, 40 litre circuit cleaning tank, 15 litre hand wash tank. Backed by the adoration for the customers, we are included in offering Pesticide Sprayer. Known for their inconvenience free operations and long practical life, these sprayers are tweaked as per client prerequisites. Pesticide Sprayer are produced by our master group who has extraordinary involvement in this field. Agriculture Pesticide Spray Gun for Power Sprayer. This is 2 Feet Half Brass High Quality Gun. We are engaged in offering Battery Sprayers, which requires minimum efforts and generates high pressure. Spraying can be done by switching on the power button located on the machine. These sprayers find their application in polishing of plant leaves and spraying pesticides on all types of field crops. 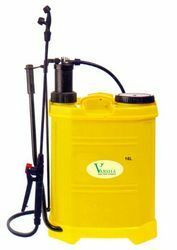 - Light weight (1.7 kgs) & user friendly sprayer. - Corrosion resistant plastic tank base. - No tools required to replace the pistons & washers. We offer Agriculture Battery Sprayer to our customer. Today we are counted among the major manufacturer's & supplier's of battery operated sprayer, which are easy to operate and require low maintenance. These sprayers find their application in polishing of plant leaves and spraying of pesticides on crops.used to- spray pesticide on crops.